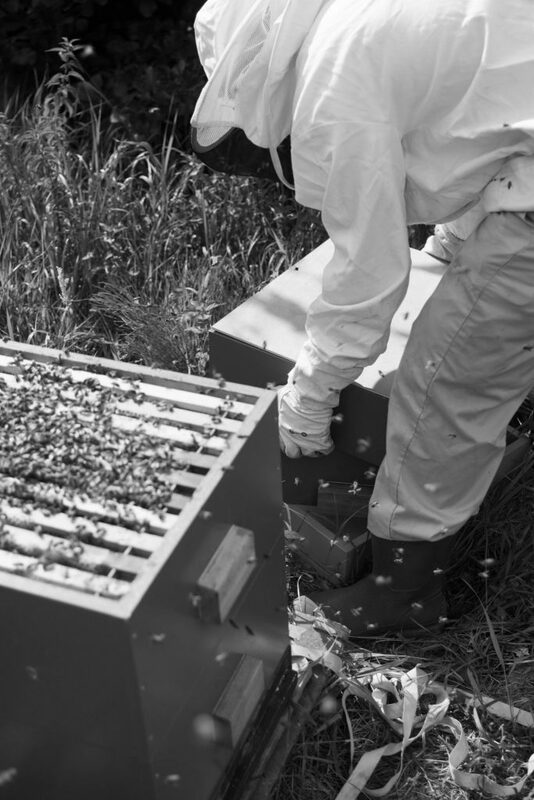 In the United States most professional beekeepers earn money with pollination services. They migrate their hives across state to pollinate different crops throughout the year. For small beekeepers this is not viable because their beekeeping operation is too small and they often maintain a full time job next to it. Earning a few bucks on the site is possible and it would even be nice if the beekeeping would break even. But how do you earn money with beekeeping? I considered it myself to start up a part time commercial business and below you can find a short summary on revenue streams. Revenue streams can be divided by selling bee products, selling bees, selling services and wholesale equipment. If you think about honey bees, you think about honey. Depending on your local area it is possible the bees harvest a surpluss of honeyThis can be extracted and sold to the people around you. Depending on the kind of honey and the availability, the price can vary from 4,50 till 11,00 euros for 500 grams (1 pound). You have to keep in mind you first need to invest money to process the honey. Also keep in mind you need packaging labelling and your manual hour rate. But selling honey can be a good income stream, especially if you travel to commercial flower fields and you pollinate flowers for a farmer. Some flowers are nectar rich and can really deliver a lot of honey for one hive. The amount of honey that a bee hive can collect differs from 5 kg to 30 kg for each hive. Brother Adam which developed the Buck fast bee, sometimes noted 325 kg honey per year for one hive. Pollen are the most important source of nutrients for the bees. Pollen contain protein, carbohydrates, lipids, vitamins and minerals. In addition to our health, pollen can be a big benefit in our health for minimizing seasonal allergies and supplement our food diet. Pollen are easy to harvest and can be dried and packaged. After it can be directly sold to your customers. Propolis is a natural anti biotic which is effective against bacteria, fungi and viruses. A great benefit for the bees but also benefits humans. Propolis is known to benefit skin diseases, infections, can lower blood pressure and is able to calm down seasonal allergies. Although propolis is unknown to most people it can provide a lot of value to some people. And propolis can easily be harvested by the beekeeper with a propolis trap. When available it can be sold as raw product or other product. The price for raw propolis is around 6 euro for 25 grams. When wax gets old and brown, beekeepers will melt it down to remove impurities. What is left is the yellow beautiful wax. Beekeepers themselves use it to make new wax foundations. But wax can also be used to make (cosmetic) products such as (lip) balm, lotion or candles. Wax can be sold as a raw materials to producers of cosmetic products and other amateurs. In the US bee packages are the standard for buying bees. Because beekeeping in Europe is more hobby related bee packages cannot be bought. But there is a huge market for selling bee hives to amateur beekeepers. When you consider selling bees there are two types available. Separate queen or whole hive sale. There is always demand for high quality bees, which are selected on honey collection, disease resistance, swarm resistance and friendliness. If you choose to bred your own queens and select specific criteria you can demand top dollar for top quality queen bees. The queen is usually mailed through postal service to the new owner. The price for queen bees depends on subspecies and availability. Queen bees are normally bred on demand, so customers have to pre-order to receive a queen. In the Netherlands it is common to sell nucs instead of packages. When you sell hives you can choose to sell the bee hive with housing or without. You will sell the beehive by amount of frames. E.g. a bee hive consists of 5 frames and you charge the client 12.50 euro for each frame. Raising bees can be quite commercially viable. In the Netherlands even hybrid bees can bring in quite some money. It is recommended to only sell bees during the beekeeping season and not in the winter. When you start delivering pollination services you can consider yourself a professional beekeeper. For a certain period, you move your hives to a crop field. When you provide pollination services you must have spare bees to provide when the bees do not pollinate sufficiently. You have to deliver pollination as a service and if your bees do not comply payment may be declined. The pollination business is a tough one to withstand. You are truly dependent on your bees to make your income. In recent years’ bee mortality is high and can wipe out your whole apiary which is your sole income. But when you do succeed to provide pollination, it can be a profitable business. Authentic products sell better than never before. Businesses are selling more and more local authentic products. And as small beekeeper you have a great opportunity in this market. Businesses can rent or lease a beehive after which you guarantee them the honey from the beehive. E.g. An exclusive restaurant or hotel wants its own honey to sell to their customers. You as local beekeeper can provide them with a hive which you maintain. Often it is even possible to locate the hive on their property. This can be a true win win scenario, you meet other people and have unique places to locate your hives and the business can promise true local products to their clients. When you keep bees there is also demand for bee equipment and housing. You can be the middle man for such products. If you have a spare garage or empty space available to store the commercial merchandise. You can earn a nice premium. Earning money with beekeeping is quite hard and if you plan to monetize your operation it is certainly recommended to dffer your income streams. The title of this post is a bit double sided, because really the answer to “how to make 10000 dollars with beekeeping? Is to start with 20000 dollar. Most professional beekeepers I know earn money with wholesaling products. E.g. Honey, beauty products, bee hives, equipment and removal services.